Whisk together the tahini, lime juice, soy sauce, ginger and sugar. Loosen the mixture with a splash of water to create the perfect dipping consistency. Take a large mixing bowl and fill with warm water. Gather together the remaining ingredients so they are all to hand. Soak a rice paper wrapper in the warm water for about 20 seconds and place on a damp, clean tea towel. 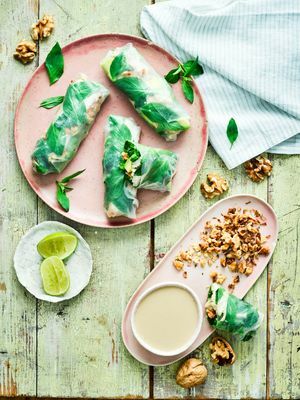 Put a little chicken, avocado, watercress and a sprinkle of the herbs in the middle of the wrapper, then sprinkle with some of the California walnuts. Fold in the edges of the wrapper over the filling and roll up the opposite edges to seal. Continue this process with the remaining ingredients. Serve with the dipping sauce and remaining chopped California walnuts on the side to dip as you go.